The Boss RC-202 Loop Station is a trimmed-down version of the company’s mighty RC-505, and is so named because it has only two stereo tracks, rather than the latter’s five. But to call it ‘trimmed-down’ does this smaller, neater model a disservice because, in one respect at least, it comes out on top: up to four ‘Input FX’ and four ‘Track FX’ are available simultaneously, whereas the ‘505 manages only three and three (since its v2.0 update). In both machines, Roland have taken a different approach from that of many loopers, and I’ll quickly run through the main limitations before going any further. First, no matter how long you’re in overdub mode, the older material doesn’t age, fade, die or degrade. Second, there’s no ‘bounce-down’ capability. So although you can process audio during recording with the input effects, you can’t ‘print’ or mix down the track effects (or the main output) to create a new loop. The sole exceptions to this are the vinyl simulation and ‘Beat’ effects that scramble, shift and repeat audio; these alone can be overdubbed onto an existing track. Having got that out of the way, it’s mostly plain sailing. 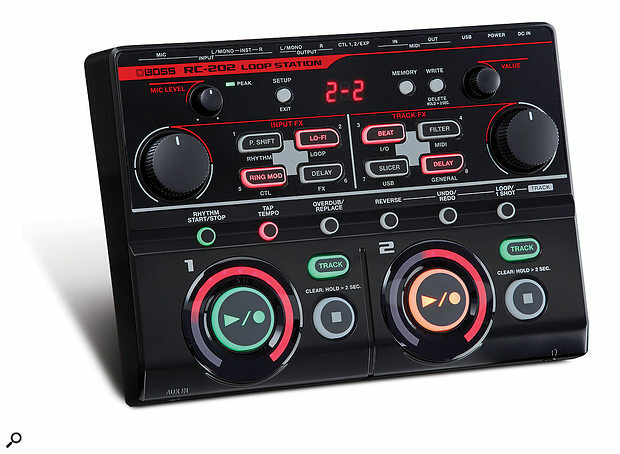 The RC-202 has two separate stereo tracks, each of any length. The only practical limit appears to be the 2GB maximum file size. Data are stored in WAV format (16-bit, 44.1kHz) and the internal capacity allows for up to three hours of recording time — seriously! Your time can be allocated freely amongst eight banks, each with eight phrase memories (the contents of the two tracks). Best of all you can write during playback and therefore develop song-like structures on the fly. Indeed, the bank/phrase allocation is much easier for this than the older model’s 0-99 pattern organisation. Furthermore, at a press of the Memory button, the eight FX buttons act as phrase selectors, with the added advantage that the empty ones are quickly identified. Roland have once again opted for the ‘shiny plastic’ look for the externals but the RC-202 still feels very solid. The large rubber pads for play/record/overdub handle beautifully and indicate loop activity as a moving red orbit. There’s generous use of colour throughout: red, green, purple, orange and blue are all available to link tracks to effects, show playback direction, running mode and so forth. It’s not all plain sailing though, as the minimal display introduces a few challenges. Not only are all the effect algorithms reduced to three-character abbreviations, but their parameters are similarly abbreviated, so you have quite a lot to remember. It’s worth downloading the parameter guide and keeping it close to the printed owner’s manual. This, incidentally, looks reassuringly thick and engrossing... until you realise it’s printed in eight languages and runs to just 20 pages of content! You can record from the XLR microphone input (which can supply phantom power), the line inputs, the front-loading stereo aux input, or all sources at once. Input levels are represented clearly in green, amber or red and there’s a dedicated knob on hand to keep overloads at bay. Simplicity has clearly been a design priority and when MIDI synced or using one of the built-in rhythms, the default ‘play quantise’ tidies any clumsiness in button tapping, ensuring your loops will always fit the selected time signature. The process must work smoothly because I never needed to give it a thought, and I didn’t lose sync once. Having set the levels, you hit record and perform for as many bars as you like before flipping into play or overdub mode. If you don’t like what you hear, you can undo the last recording or trash the whole thing at any stage and start over. Assuming you’re happy, the exercise is then repeated for the second track, saving your work to new phrase memories as you go if necessary. The controls and shortcuts are well crafted for fast hands-on operation, but there are foot-pedal options in abundance for when you don’t have a hand free. Taking advantage of the extensive catalogue of input effects, you can build up a series of impressive-sounding loops from a single synth, your voice, a guitar, or anything. The effects range from good to excellent and include sync’ed delays, filters, reverb, slicers, repeaters, vinyl effects and more. The FX buttons are named according to type but it transpires these are only guidelines. Within certain restrictions you can change the effects under each button and thus add greater versatility. For performance, there’s a large knob to control the effect’s most significant parameter. Amongst the restrictions is that you can’t have more than one reverb as either an input or track effect, and that some algorithms are excluded from the Input FX list — those beat manglers, for example. However, there’s a great deal to explore and to exploit. I had mixed feelings about the vocoder but was very pleasantly surprised by the Synth effect, which tracked my voice surprisingly well. Recording some voice-triggered synth, then overdubbing some robot voice and pitch-shifter effects was a total blast; it suggested a powerful and compact travelling setup with just the addition of the tiny microphone borrowed from my Korg Microsampler. The I/O caters for both mono and stereo signals, as well as offering MIDI and USB connectivity. There’s no way to divide the effects between the two tracks — one or both are processed equally by all that are active. Additionally, tracks can play in reverse mode or play through just once. The only proviso before switching to ‘one-shot’ mode is that the track must first be stopped. After that, each hit of the play button will fire it off (in sync) to play right through. When you make one or both tracks one-shot or reverse, the status is remembered in each phrase memory, along with track level, rhythm and so on. Effect selections are stored either per phrase memory or per bank, which is darn flexible. There’s no doubt the feature I missed most from the RC-505 was having a level slider for each track. In the RC-202, you need to press the Track button before adjusting the level with the Value encoder. I occasionally managed to select a new phrase doing this, and in the process lost whatever I’d been working on — so it’s worth stressing that you need to write your changes often to keep them safe. I can’t have been the only one to fall foul of this behaviour, because there’s an option included to tackle it, labelled ‘disable the Value knob when in the Play Screen’. The 17 built-in grooves are varied enough to play along with, and there’s a greater choice of time signatures than is usually offered. For each signature there’s a matching groove and I found any of the simple hi-hat patterns were an ideal metronome, especially when delivered direct to the headphone output (bypassing the main stereo mix). Indulging in a spot of 5/4, 9/8 or 15/8 can be a seriously cool diversion from regular 4/4, and swapping between patterns during playback is fairly seamless too. Finally, phrase memories can be selected remotely using MIDI program changes, and these are also transmitted to enable synchronisation with other pattern-based gear (eg. Electribes, Elektron boxes, another RC-202). If you connect the RC-202 to your PC or Mac via USB, WAVs can be freely dragged in and out for backup and restore. This also means you can incorporate slick, studio-constructed loops (provided they are in the correct format) into your live performances. The inverse option is possibly even more exciting: you can arrange all the loops you created live and computer-free into finished songs. And as an extra cherry on top, in keeping with much of Roland’s recent equipment, the RC-202 can be an audio/MIDI interface. I encountered a few bugs and anomalies. For example, when building a series of loops from scratch, if you choose a new location for the phrase, both the current slot and the new destination are written to. It would seem more logical to only save to the one chosen. And sometimes, after a track has been in one-shot mode and you’ve changed it to loop again, there’s an audible pause at the end of the first pass. Generally though, it worked reliably and intuitively, although I must just mention one last issue: time-stretching. When externally synced, the time-stretch function becomes pretty ropey if, post-recording, you deviate more than a few bpm from the source tempo. Fortunately, if you use the RC-202 as your master clock, or don’t change the tempo, it copes very well. I’ve been using an RC-505 as my secret weapon for MIDI-synced loops for a couple of years now and I love it. Prioritising operational simplicity, the RC-202 doesn’t have all the options for mixing odd-length loops, but with just two tracks that wouldn’t make much sense anyway. For spontaneous jams that build into ambitious-sounding structures and for arrangements that incorporate prepared loops, it is fast, intuitive and painless. The grouping of banks and phrases feels more song-like than its larger sibling, and having just two tracks feels less limiting than I’d expected. Best of all, the effects count and quality is impressive — but even so, you might have anticipated a bigger price difference between the two models. Ultimately, the RC-202 is compact, straightforward and looptastic, but if size isn’t an issue and you can afford to up the budget by a modest amount, the older machine’s greater capacity, track count and polyrhythmic capabilities could prove even more tempting. Most similar loopers tend to be guitar-pedal-oriented — for instance, the Pigtronix Infinity, which also sports MIDI synchronisation. However, it doesn’t offer such finger-friendly operation, nor can it draw upon the full armoury of Boss effects. The same applies to the Electro-Harmonix 22500, which does at least feature built-in grooves. Probably the biggest rival is Boss’s slightly more expensive RC-505. A neat, intuitive looper with a superior collection of contemporary effects. Built-in grooves in a range of time signatures. Costs more than half an RC-505. No resampling or loop ageing. A compact, accessible, hands-on desktop looper with great effects and lots of internal storage.